In his homily during Mass for Vatican City government staff, Pope Francis exhorted Christians to reject gossip in developing a "new life" based on the Gospel, Radio Vaticana reports. Addressing staff from the Vatican medical services and office staff of the Vatican City Government, Pope Francis said: “The first Christian community is a timeless model for the Christian community of today, because they were of one heart and one soul, through the Holy Spirit who had brought them into a "new life". Through the Holy Spirit, the Pope said, "we are born into the new life which we have received in Baptism." "We have to do all we can to ensure that our life develops into new life”, which may be “a laborious journey” but one that “depends chiefly on the Holy Spirit” as well as our ability to be “open to his breath”. However, there are struggles along the way, the Pope warned. “When we prefer to gossip, gossip about others, criticize others- these are everyday things that happen to everyone, including me – these are the temptations of the evil one who does not want the Spirit to come to us and bring about peace and meekness in the Christian community". "These struggles always exist" in the parish, in the family, in the neighborhood, among friends”. Instead through the Spirit we are born into a new life, he makes us “meek, charitable." (Vatican Radio) The Holy See’s continuing commitment to prevent money laundering and to support financial transparency. In December, its Progress Report will be presented to MONEYVAL. The Holy See is committedly continuing its dialogue with MONEYVAL, the monitoring Committee of the Council of Europe that evaluates national measures to combat money laundering and the financing of terrorism. Yesterday, 9 April, the Committee decided by normal procedure that the Holy See’s and the Vatican City State’s next Progress Report will be presented in December of this year. Moreover, the Committee also accepted the Holy See’s own proposal that this next report cover not only the Core Recommendations, but also all the areas covered by the Key Recommendations. With this initiative, the Holy See wishes to provide a more complete overview of the measures taken over the last year to further strengthen its institutional structure in the area of preventing money laundering and the financing of terrorism. “The Lord saves us by His love: not with a letter, nor with a decree, but with his love,” a love so great that it led him to send his Son, who, “became one of us, walked with us,” and this, he said, “saves us.” The Holy Father went on to explain that “salvation” means, “the recovery of that dignity, which we have lost,” the dignity of being children of God. It has been nearly one month since the stunning announcement of the election of Pope Francis to the head of the Catholic Church, the first Jesuit and first Latin American to hold the office in history. Based on the way some have been reporting from Rome, one would think the Berlin Wall had just fallen or a “Vatican Spring” was fermenting in St. Peter’s Square. Change, transformation, and progress—these are the buzzwords for describing Pope Francis’s decisions in recent weeks, whether it is his choice to live in the unadorned papal guesthouse or the style of garments he has worn. Yet, as with most matters, a more nuanced analysis reveals a different and more surprising story. Fundamentally, Pope Francis’s papacy thus far has not been that revolutionary. Take two examples. First, those famous red shoes that Pope Francis has thus far chosen not to wear. The papal shoes are customarily made of red leather to symbolize the blood of Christians who died because of their faith. While their history dates back centuries, they have not gone unmodified during that time. Pope John XXIII added gold buckles to his; his successor Pope Paul VI simplified the shoes and removed both the buckles and gold crosses from them. Nor is Pope Francis the first to refrain from them: Pope John Paul II declined the red shoes for brown ones, instead. Or consider Pope Francis’s decision on Holy Thursday to wash the feet of women as well as men in an Italian youth detention center. The Latin instructions for the ritual use the term viri selecti to describe the participants, which is translated as “selected men.” As the 12 individuals whose feet the priest washes symbolize the 12 Apostles, this is not surprising. Nevertheless, the details of the foot washing ritual are actually the provenance of each bishop; in the U.S. for example, both men and women have been allowed to take part in the ceremony since 1987, as noted in the U.S. Conference of Catholic Bishops’ Holy Thursday Mandatum instructions. Pope Francis, as Bishop of Rome, can make the same decision for his diocese; suddenly the Holy Thursday liturgy seems much less a radical change. (Vatican Radio) Pope Francis continued his practice of celebrating morning Mass in the chapel of the Domus Sanctae Marthae, where he has been residing since the conclave that led to his election. In the congregation Thursday morning were employees of the Vatican’s newspaper, L’Osservatore Romano. The focus of his homily was the need to be attuned to the voice of God and docile to His promptings. (Vatican Radio) On Sunday, April 14, Pope Francis will take possession of the Papal Basilica of St. Paul's outside the Walls in Rome. The Pope will celebrate Mass at the Basilica together with the Benedictine Monks to whom the Basilica and the adjoining Monastery are entrusted. (Vatican Radio) “The needs of God’s people throughout the world are great” remarked Pope Francis, addressing the US based Papal Foundation Thursday in the Clementine Hall, “your efforts to advance the Church’s mission are helping to fight the many forms of material and spiritual poverty present in our human family, and to contribute to the growth of fraternity and peace”. The Foundation gathers lay Catholic men and women from across the United States, who each year gift the Holy Father a 'wish list', in short the funds to carry out or sponsor charitable works that are particularly dear to him. On Thursday the Foundation members - who are known as Stewards of St. Peter - met with the Holy Father and presented him a donation to fund projects throughout the world. The Papal Foundation awarded support to over 100 programs and projects in 2012. Grants and scholarships totaled 8,575,500 and reached around the world. From major seminaries in India to retreat centers in Colombia, kitchens, clinics and schools in Tanzania, Burundi and Congo as well as homes for the elderly in Romania and restoring churches for the faithful in Ukraine. But all of these projects are chosen by the Pope himself, constituting his very own ‘wish list’ that is drawn up each November and presented to the Foundation’s board for approval. (Vatican Radio) In following Christ, one walks with perseverance and without triumphalism, said Pope Francis in his homily during Friday morning’s Mass at Casa Santa Marta. The Mass was attended by personnel from Libreria Editrice Vaticana, including the director of the publishing house, Fr. Giuseppe Costa, as well as personnel from the Vatican pharmacy and perfume shop. When God touches a person’s heart, the Pope said in his homily, he grants a grace that lasts a lifetime; he does not perform some “magic” that lasts but an instant. The Pope reflected on the climate of agitation immediately following the death of Jesus, when the behaviour and the preaching of the Apostles caught the attention of the Pharisees. He picked up on the words of the Pharisee Gamaliel, cited in the Acts of the Apostles, who warns the Sanhedrin of the danger of attempts on the lives of Jesus’ disciples and reminds them how, in the past, the clamour generated by prophets found to be false subsided along with their followers. Gamaliel’s suggestion is to wait and see what will come of Jesus’ followers. Pope Francis told them “the Holy Scriptures are the testimony in written form of God's Word, the canonical memorial that attests to the event of Revelation. The Word of God, therefore, precedes and exceeds the Bible. It is for this reason that the center of our faith is not only a book, but a history of salvation and especially a Person, Jesus Christ”. Citing the Vatican II Dogmatic Constitution, Lumen Gentium, he said: “The interpretation of the Holy Scriptures cannot be only an individual scientific effort, but must always confront itself with, be inserted within and authenticated by the living tradition of the Church…. The texts inspired by God were entrusted to the Community of believers…to nourish the faith …respect for this profound nature of Scripture conditions the very validity and effectiveness of biblical hermeneutics”. Thus the Holy Father concluded, any interpretation that is either “subjective or simply limited to an analysis incapable of embracing the global meaning that has constituted the Tradition of the entire People of God over the centuries” is simply insufficient. In short there is an unbreakable unity between Scripture and Tradition. Below a Vatican Radio translation of the full text of Pope Francis’ discourse to the Pontifical Biblical Commission, April 12, 2013. Vatican Radio) On the eve of the 1-month anniversary of his election to the Papacy, Pope Francis visited the ‘Terza Loggia’ or Third Loggia of the Apostolic Palace Friday, home to his 'closest collaborators' and 'family', the Secretariat of State. The two sections of the administrative arm of the Holy See are manned by 300 people under the guidance of the Secretary of State, Cardinal Tarcisio Bertone. Cardinal Bertone greeted the Pope on behalf of his staff: “we are very pleased with this exceptional visit to the headquarters of the Secretariat of State. Here is the great family of your closest collaborators; the Secretariat of State that is, in fact, the real papal secretariat in the two sections: the General Affairs and the Section for Relations with States, with superiors and with all those responsible for the different sectors, with all employees. So you also see a variety of vocations that are represented here. We are grateful for your visit, we are excited by the momentum that you have given to the Petrine ministry and we hope that it will pervade, that it will animate us too in carrying out our mission not only with diligence, but above all with love and dedication for the good of the Church. We ask you for your blessing and pledge our devotion, our loyalty and our daily prayer”. VATICAN CITY, April 12 (Reuters) - Pope Francis held his first meeting on Friday with staff of the Vatican department that was at the centre of last year's scandal over leaked documents alleging corruption, ahead of expected changes to its leadership. Francis inherited a Church struggling to deal with priests' sexual abuse of children; the alleged corruption and infighting in the Vatican's central administration, known as the Curia; and conflict over the running of the Vatican's scandal-ridden bank. Benedict left a secret report for Francis on the problems in the administration, which came to light when sensitive documents were stolen from the pope's desk and leaked by his butler in what became know as the "Vatileaks" scandal. Rome (CNN) -- Pope Francis has appointed a group of eight cardinals from around the world to look into ways of reforming the Catholic Church, the Vatican said Saturday. The group, which includes U.S. Cardinal Sean O'Malley from Boston, will examine ways to revise the Vatican constitution, Pastor Bonus, which sets the rules for running the Roman Curia, or church hierarchy. The cardinals -- who come from North America, Latin America, Africa, Asia and Europe -- will first meet in October, the Vatican said. The move follows on from suggestions made during the General Congregations, a series of meetings that brought together all the cardinals last month before they elected Francis as pope, the Vatican said. The other seven cardinals are: Giuseppe Bertello, president of the Vatican City State governorate; Francisco Javier Errazuriz Ossa from Chile; Oswald Gracias from India; Reinhard Marx from Germany; Laurent Monsengwo Pasinya from the Democratic Republic of the Congo; George Pell from Australia; and Oscar Andres Rodriguez Maradiaga from Honduras. An Italian bishop, Monsignor Marcello Semeraro, will act as secretary for the group. Pope Francis has already been in touch with the chosen cardinals, the Vatican said. The Catholic Church has faced calls for reform in the wake of scandals involving the sexual abuse of children by priests and allegations of corruption. The Rev. Thomas Rosica, issuing guidance on behalf of the Vatican, said the group of cardinals was just that -- "not a commission, committee or council." It "has no legislative power and its main function is to 'advise' the pope," he said. "The group will not in any way interfere in the normal functions of the Roman Curia, which helps the Pope in the daily governance of the Church." The group's formation, exactly a month after Francis was elected, shows that the pope "listens attentively" to what the cardinals say, Rosica said. The document the cardinals are studying is the Apostolic Constitution of Pope John Paul II, known as the Pastor Bonus, which was published in 1988. Pope Francis named eight cardinals from around the globe Saturday to advise him on running the Catholic Church and reforming the Vatican bureaucracy, marking his first month as pope with a major initiative to reflect the universal nature of the church in key governing decisions. In its announcement Saturday, the Vatican said Francis got the idea to form the advisory body from the pre-conclave meetings where such complaints were aired. "He has formed a group of cardinals to advise him in the governing of the universal church and to study a revision of the apostolic constitution Pastor Bonus on the Roman Curia," the statement said. VATICAN CITY — Pope Francis on Saturday named eight cardinals to a panel that will help advise him running the church and reforming the Vatican bureaucracy, or Curia. Seven non-Vatican officials were drawn from Africa, Asia, Australia, Europe, North and South America to give it geographical breadth. Cardinal Giuseppe Bertello, president of the Vatican city state administration that runs the actual functioning of the Vatican, including its profit-making museums. There has been much speculation that Bertello might take on a greater role in Francis’ administration; he has been mentioned as a possible secretary of state. Cardinal Francisco Javier Errazuriz Ossa, the retired archbishop of Santiago, Chile. Like the former Cardinal Jorge Mario Bergoglio, Errazuriz was a papal contender in the 2005 conclave, since he was then the president of the powerful Latin American Conference of Bishops. This time around, at age 79, he was dogged by allegations that he mishandled the case of a notorious sexually abusive priest. Francis' Friar – O'Malley, The "Super-Cardinal"
To repeat a line once said of Seán O'Malley among his Capuchin confreres, "The stone rejected by the builders has become the cornerstone." So the more recent story goes, in the days after Pope Francis' election, the cardinal-archbishop of Boston dispatched his priest secretary to the Domus with a note for the new pontiff, ordering the aide "to give this letter to someone who will put it into the Pope’s hands." As it turned out, Fr Jonathan Gaspar didn't just end up delivering the message – he was received by the Pope. 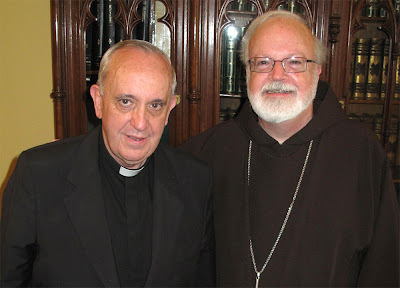 While we don't know the contents, they were clearly appreciated – this morning, O'Malley was the lone North American named to Papa Bergoglio's eight-cardinal "task force" chartered both to advise Francis in his universal role and study the reform of the Roman Curia. Given the significance of the call, perhaps it's to be expected that some have wondered why the nod fell to the 68 year-old Capuchin as opposed to others. Language -- Put simply, Francis' English is cursory at best; before his election, Cardinal Bergoglio conceded that it was the "toughest" tongue for him to grasp. Ergo, with a doctorate in Spanish and Portuguese literature and having spent the bulk of his priesthood happily engaged in Hispanic ministry, O'Malley – who still says his private prayers in Spanish – is the most fluent North American cardinal in the Pope's home-idiom, at least until Archbishop José Gomez of Los Angeles receives the red hat. (Vatican Radio) Pope Francis celebrated Mass on Sunday evening in the Papal Basilica of St Paul Outside the Walls. Proclamation, witness, and worship were the three key ideas on which Pope Francis focused in his homily, with especial emphasis on those who suffer for their witness to the Faith. Below, please find the full text of his homily, in English. The Pope drew inspiration from the daily readings, in particular the first reading that recounts the episode of Stephen, the first martyr of the Church, being dragged before the Sanhedrin because of his witness to the Gospel. Pope Francis noted that Stephen was a victim of calumny. He is accused of “false witness” but it is not a “fair fight, a fight between good men”, noted Pope Francis, because Stephen’s enemies chose the path of a dirty fight, “the path of calumny”. Calumny he continued is worse than sin - it is the direct expression of Satan. "We are all sinners; all of us. We all commit sins. But calumny is something else. It is of course a sin, too, but it is something more. Calumny aims to destroy the work of God, and calumny comes from a very evil thing: it is born of hatred. And hate is the work of Satan. Calumny destroys the work of God in people, in their souls. Calumny uses lies to get ahead. And let us be in no doubt, eh? : Where there is calumny, there is Satan himself. " (Vatican Radio) Below we publish a communique issued Monday by the Congregation for the Doctrine of the Faith concerning a meeting with the Presidency of the Leadership Conference of the Women Religious in the USA. Doctrinal Assessment of the LCWR, also participated in the meeting. staffed by Religious over the years. the direction of the Holy See (Cf. Code of Canon Law, cann. 708-709).